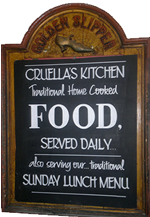 We offer good quality home cooked food, prepared on the premises where possible. Produce locally sourced wherever we can. We are renowned for our Homemade Yorkshire Puddings, our steak and ale pie and our delicious hand cut freshly cooked chips. Function room available to seat 50. Buffets and set menus are available.